Stuck or broken keys don’t have to be a problem, thanks to our MacBook Pro keyboard replacement service. We’re quick, we’re reliable, and we only fit genuine spare parts. You’ll get the same quality keyboard and backlight you would from an Apple service or repair, and because we don’t have to send your machine away to be fixed you’ll get it back quicker too. Our MacBook keyboard replacement service is cheaper than national repair centres and Apple services. We only charge you for the spare parts and the work, not the brand. And we charge a fixed price, so you know exactly what you’re paying before you give us your laptop. We repair MacBook Pro keyboard assemblies when you need us to—even if it’s the evening or the weekend. Our friendly, professional engineers are on call 7 days a week, and will come to your home or place of business whenever you need. Urgent project or vital movie marathon, we’re who you call when you want your Apple keyboard replacement to happen right now. We’re local. Our MacBook Pro keyboard replacement service covers the whole of London, from Balham to Barnet. As long as your machine is within the M25 boundary, we’ll pick it up. If you’re in the area, you can even drop your MacBook off at one of our shops. And in the majority of cases, we’ll have the new keyboard in on the same day. Our MacBook keyboard replacement service prolongs the life of your Mac. Don’t spend hundreds or thousands on a new laptop just because the keyboard has stopped working. Call us first. Macbook KEYBOARD replacement – What options? Whether you use it for home or business, the keyboard on your MacBook Pro takes a hammering. Status updates, shopping lists, presentations, dissertations—the list is endless. In fact, when you own a Mac, it’s more than endless. Because Macs end up getting used by everyone, all day long. From the morning email to the afternoon client work to the evening’s entertainment, your MacBook barely gets a rest. No wonder the keyboard goes long before anything else. Our MacBook keyboard replacement service is here to get your machine back in full working order, quickly. We stock or have access to all models of Mac keyboard, for both recent and historic MacBooks. And we can do an Apple keyboard repair with or without backlight. MacBook keyboard replacement. By people who know Macs. Our Macbook keyboard replacement service is carried out by Mac experts, with years of experience in diagnosing and fixing MacBook issues. They’re familiar with the internal layouts of all MacBook models, and can replace your broken keyboard in a fraction of the time it would take to do it yourself. They know which wires to uncouple and which printed circuits to remove, in order to get to the keyboard. And they know what everything does, so when it comes to putting your machine back together there are no nasty surprises. And no leftover bits at the end. The best MacBook keyboard replacement cost in town. When we say we offer the best MacBook keyboard replacement cost in town, we mean it. We don’t hide extra fees in your bill, and we don’t charge more to cover internal costs we don’t have. 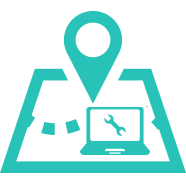 Other companies may add to your fee to pay for third-party shipping and repair at a centralised location. We do everything on-site. And that means you pay for the new keyboard, the new backlight, the work. And that’s it. Quality parts. And a year’s guarantee. What do you want to know, when you book your Apple keyboard replacement? That the lorry delivering your MacBook back to the store has a famous logo on the side of it? That the people taking care of your tech have a fancy name dreamed up by a marketing department? No. You want to know you’re getting genuine spare parts, a guarantee, and the quick return of your MacBook. We don’t call ourselves ‘the Geek crew’, or talk about being ‘tech nerds’. We just do Mac keyboard repair. Really well. With approved spare parts, which we guarantee for a year. Then we send back your machine, usually on the same day. You can call us what you like. And you can stick whatever you want on the side of our van. We’ll just carry on delivering a superb MacBook Pro keyboard repair service. It’s how we roll. Our engineers are approachable, polite, and professional. They get the job done with the minimum of fuss, and they never use unnecessary technical terminology. Not even when they’re disconnecting the logic board, or de-routing the power switch from beneath your MacBook’s antenna. They simply turn up, diagnose the keyboard fault, and take your MacBook away for a professional Apple keyboard repair. All MacBooks. All keyboards. Repaired. Need MacBook Air keyboard repair? A MacBook Pro 13 keyboard replacement? Whatever your model, and whatever the problem, we’ve got the knowledge and the spare parts to fix it. And if we can’t fix it on the spot, we’ll have the parts in and your machine fixed the next day. That’s MacBook keyboard repair, MacBook Pro keyboard repair, and MacBook Air keyboard repair. All fixed. Fast. Yes. The MacBook keyboard unit is fixed underneath the top of the metal shell, so you’ll have to remove most of the laptop’s innards to get to it. For this reason, we recommend that only experts attempt to repair MacBook Pro keyboard units. But if you feel confident removing the logic board and optical drive (in older MacBook models), and removing the 60 screws that attach the keyboard assembly to the aluminium housing, you can. You’ll need to be careful not to sever the trackpad cable, which is glued to the existing keyboard assembly. It’s also necessary to remove the power button, which can result in a lost spring and a power button that no longer works. Once the keyboard assembly is removed from the trackpad cable, you’ll also need to be careful not to damage the three layers of the backlight when you remove them. Or when you stick them back in place. OK, so it’s probably not a good idea to undertake an Apple keyboard repair unless you’re a qualified engineer. But that’s not a problem, because you don’t have to. We’re here to do it for you, quickly and efficiently. And for a fixed price that’s guaranteed to make you happy.